SatTrackCam Leiden (Cospar 4353) is a satellite tracking station located at Leiden, the Netherlands. The tracking focus is on classified objects - i.e. "spy satellites". With a camera, accurate positional measurements on satellites of interest are obtained in order to determine their orbits. 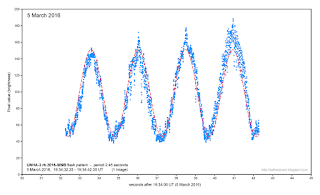 Orbital behaviour is analysed. 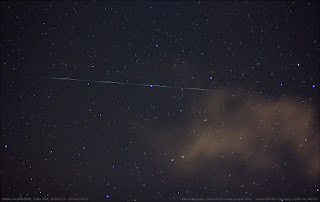 The image above, taken in the evening of 5 March 2016, is a 10-second exposure showing several flashes of the tumbling UNHA-3/Kwangmyŏngsŏng rb 2016-009B, the upper stage from North Korea's recent Kwangmyŏngsŏng-4 launch. It was taken during a very favourable 67-degree elevation pass, using my Canon EOS 60D and a SamYang 1.4/85mm lens (set at F2.0). The sky had cleared just in time for this pass (a last wisp of clouds is still visible in the image). I have briefly mentioned the tumbling behaviour of this rocket stage in an earlier post. Over the past week I have been following this rocket when weather allowed, obtaining observations in the evenings of Feb 28, Feb 29, March 3 and March 5. This now allows a first look at how the tumble rate is (very) slowly changing. The theory behind tumbling rocket stages and why their tumble rate changes over time, is briefly discussed here on the satobs.org site. After the payload and the upper stage separate, usually by means of exploding bolts, the upper stage gets a momentum from this separation. Over time, the resulting tumble is influenced by interaction of the rocket stage body with the earth's magnetic field. Spent upper stages are basically hollow metal tubes, and the Earth's magnetic field causes induction in it, leading to the tube getting an electric charge. Basically, the rocket stage becomes a dynamo. The Earth's magnetic field then further interacts with this electrically charged rocket stage, by means of the Lorentz force exerting a magnetic torque on the rocket stage's spinning motion. It is the latter effect which by "tugging" on the tumbling stage, changes its momentum, with a changing tumble period as a result. The resulting change is one towards a slower tumble rate, and eventually the stage might stop tumbling altogether. 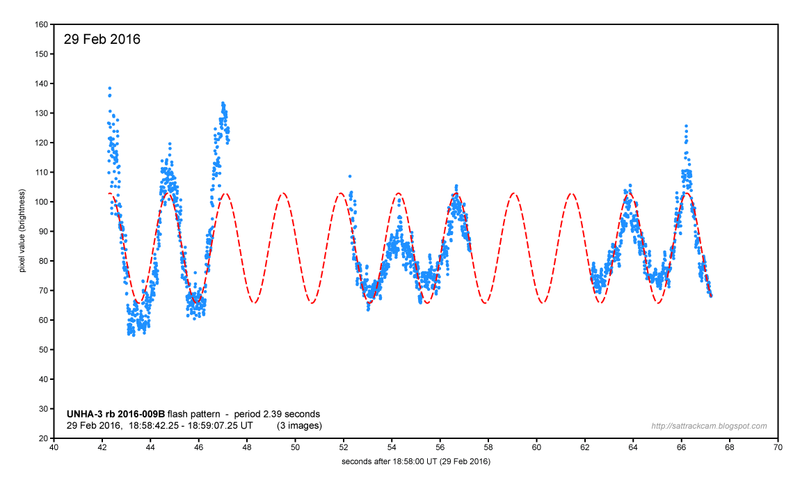 I earlier established a peak-to-peak period of 2.39 seconds for 2009-009B from observations on Feb 28 and 29. 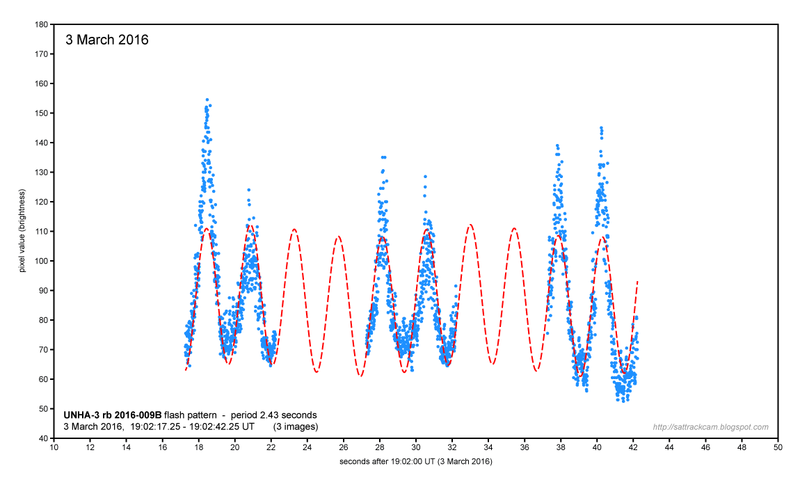 Analysis of the new data obtained on March 3 and 5 show that the period is changing: I get 2.43 seconds for March 3 and 2.45 seconds for March 5. I re-analyzed the Feb 28 and 29 data as well, this time using a fit to a running 5-point average on the raw data, which leads to somewhat better refined peaks. I also found that the initial autofit made by PAST is actually not the best fit, based on the r-square values of the fit. 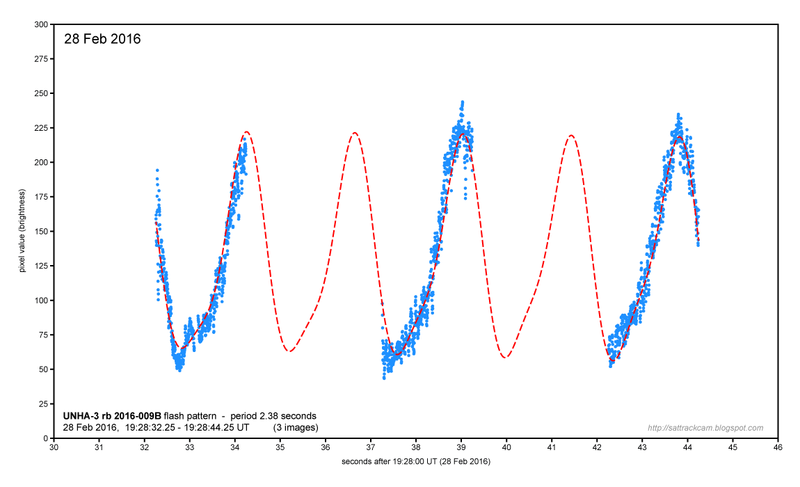 re-analysis leads to a 0.01 second revision to 2.38 seconds of the Feb 28 period, while the Feb 29 period stays at 2.39 seconds as initially established. Even though the differences are very small, there appears to be an increasing trend to the periodicity, at the rate of about 0.01 second per day. As the difference is systematic, it is probably real and not just scatter due to measuring uncertainty (time will tell if this indeed holds). One caveat: the synodic effect. As the viewing angle changes over the pass, this has some influence on the determined period. For fast tumblers this effect is small, but as we are talking about differences in the order of a few 0.01 seconds, the synodic effect comes into play. I got a number of questions on how, and with what software, I produce these brightness curves. I will briefly explain below. What is first necessary, is that the real duration of the exposure is carefully calibrated. A "10-second" exposure set on your camera is not exactly 10.000 seconds: with my Canon EOS 60D for example, it is 10.05 seconds in reality (this deviation seems to increase exponentially with exposure time: a "15-second" exposure for example is in reality closer to 16 seconds!). The pixel brightness over the trail on the photograph is measured using the free astrophoto software IRIS. Load the image, and chose "slice" from the menu option "view". Put the cursor at the start of the trail, and draw a line over the trail to the end of the trail. A window pops up with a diagram. You can save the data behind this diagram as a .txt table. NB: be aware that Iris always measures from left to right (no matter how you draw the line), so if the satellite moved from right to left, you will later have to invert the obtained data series. The resulting .txt data file is read into excel. There, if necessary I first invert the series (see remark above). The result is a table with a column with pixel brightness values, to which I ad an increasing pixel count. I then ad another column, representing the time for each pixel measurement. The value of the first cell is the start time of the image in seconds (I usually take the number of seconds after a whole minute, e.g. if the image started at 19:43:32.25 UT the value in this cell is "32.25". If I have a total number of pixels of say 430 (with 430 corresponding pixel brightness values), and an exposure time of 10.05 seconds, then I type this in the cell below it: "=[cell above it]+(exposure/number of pixels - 1)". In our example: "[cell above it] +(10.05/429)". Then drag this down to the end of the column: the last value now should correspond to the end time of the exposure (in our example, it should be "42.30", i.e. 32.25 + 10.05). If the raw data graph shows a lot of scatter, it can be useful to apply a running average to the data. (Note: this approach assumes that the angular motion of the tumbling satellite or rocket stage was fixed over the exposure time in question. In reality, this is not the case. But for short time spans of a few seconds, this can usually be ignored, certainly if the image was taken near culmination of the object. It does introduce some deviation in the result though. Compensating for this makes the exercise a hell of a lot more complicated). I then copy the columns with the times and pixel brightness values, and paste them into PAST v.3 (very neat and free statistical software developed by paleontologists. I like it because it is versatile and able to create publication quality vector-format diagrams - the latter ability is something often lacking in such packages). Press "shift" and select the two columns. Next, under "model" chose "sum-of-sinusoids". Next, a pop-up screen with a diagram appears. Select "points" under "graph style". I leave "Phase" on "free". You then check the checkbox "fit periods" and click the "compute" button. It will fit a period. However, I have noted that for some odd reason, the fitted period is not always the best fitting period! Check this by unchecking the "fit period" box, and in the box with the period result, varying the value from the initial fit slightly, after which you press the button "compute" again (leave the "fit period" box unchecked). Look at the R^2 values, and by trial and error find the best R^2 value. This is your actual period. If your graph shows clearly skewed rather than sinusoidal peaks, than there is a second period interacting with the main period (for example, complex spin motion over two axis, or weaker secondary peaks present). You can try to model this by chosing "2" under "partials". If you want a nice publishable diagram, press "graph settings" after you are done and adjust the diagram to your liking. Save it as .svg if you want to edit it further in for example Illustrator (as I do), otherwise use one of the other image formats available. 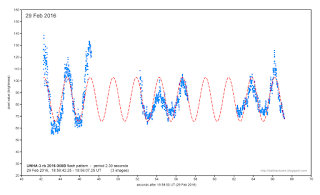 We were wondering are you doing any correction for atmospheric turbulence (scintillation) in your plots? If so how are you correcting for this effect? We are going at it a little different than you using Image J.We frame the track then averaging the image then doing surface plot to look for possible tumble of the satellite. One other possible way to get at atmospheric turbulence (scintillation) is to apply a deconvolution process to the image or in video images. Since we are dealing with some video brightness changes of the satellite causes by atmospheric turbulence (scintillation) become more apparent but even with still images the effects of atmospheric turbulence (scintillation) does play a roll in the dimming or brightening of the satellite. We made some surface plots of your last UNHA-3 image and the tumble does show nicely. Marco thanks for explaining the process you using which will help us further refine our process. The only kind of correction I do, is applying a running average (in this analysis: a 5-point running average). Effects of scintillation are usually of very short duration. It introduces scatter in pixel brightness values, and a running average smooths these out somewhat. 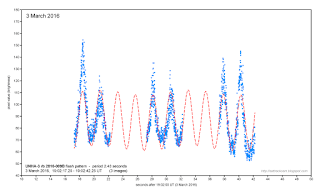 With flash periods and flash durations of the kind in this analysis, scintillation imo is not really a problem, because the period and shape of the curve are at a timescale orders of magnitudes larger than the timescale of scintillation, in this particular case of the UNHA-3 rb. Here are links to two plot we made. 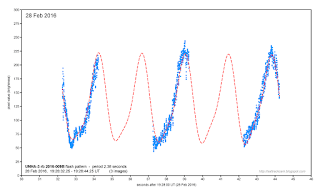 The first one shows the tumble of the North Korean KMS 3-2 satellite and the second is the plot of the stable Russian Okean 1-7 SL 14 rocket body though we are looking at them on very short arc. 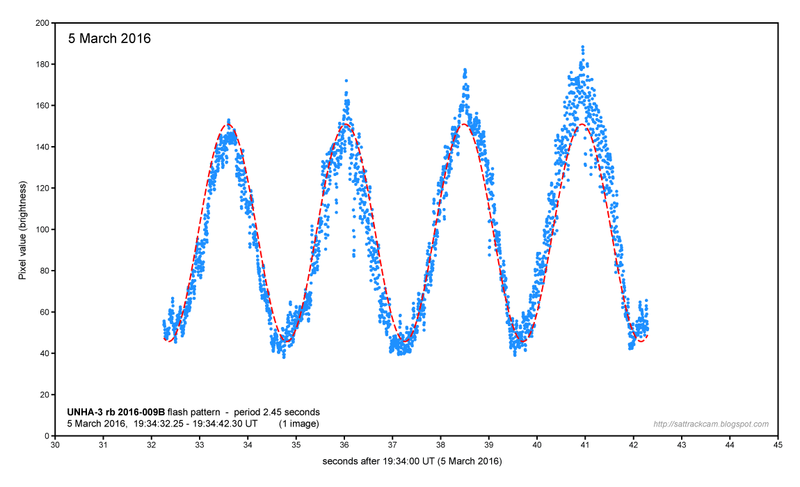 If you should have the time could you have a go at light curve for Tiangong 1 on a high pass if you have the chance. Tiangong 1 is not visible from my latitude (51 N). Yep see your issue with Tiangong 1 never gets higher than 15 degrees for Leiden. Our reason for asking from an observation of Tiangong 1 which was shot a couple of weeks back seems the station may be tumbling. We are going to try and image it again using a wider field lens to give longer arc of observation to see if this is truly the case. Also have a video camera being built with frame integration for exposures of up to 17 seconds which should be coming soon which will give us a better look at satellite candidates that maybe be tumbling which is our interest. Thanks Marco for the reply. Dutch, 48, PhD, stone age archaeologist, meteoriticist, satellite tracker, meteor observer, asteroid discoverer. Consultant in a Space Situational Awareness project with the Space Security Center of the Royal Dutch Air Force and Leiden Observatory. As an invited expert I advised members of Dutch Parliament about military satellite systems and their locations during a 2016 foreign affairs committee hearing about the MH17 disaster. Asteroid (183294) Langbroek was named after me. In 2012, I received the Dr. J. van der Bilt Prize of the Royal Dutch Astronomy Association (KNVWS) for my work on meteors, asteroids and satellites. Opinions expressed on this blog are entirely my own. Use of photographs and video from this blog for scientific or educational purposes, or by news agencies in news items is allowed, provided that the source is acknowledged. Images are released under a Creative Commons BY-NC license, except for those released on Wikicommons under the license stated there, and with the addition that news media may freely use them with source acknowledgement. Note that this only concerns my own imagery posted here, not imagery by others which I post with permission! In order to promote international co-operation in the peaceful exploration and use of outer space, States Parties to the Treaty conducting activities in outer space, including the moon and other celestial bodies, agree to inform the Secretary-General of the United Nations as well as the public and the international scientific community, to the greatest extent feasible and practicable, of the nature, conduct, locations and results of such activities. On receiving the said information, the Secretary-General of the United Nations should be prepared to disseminate it immediately and effectively.